The British Province Library at Aylesford Priory in Kent. A number of Carmelite Institutes exist around the globe, each with a particular remit and project focus, ranging from the promotion of spirituality at the popular level to scholarly academies for established scholars. Most Provinces have a research-level library and archives that members of the public are welcome to consult following prior enquiry. 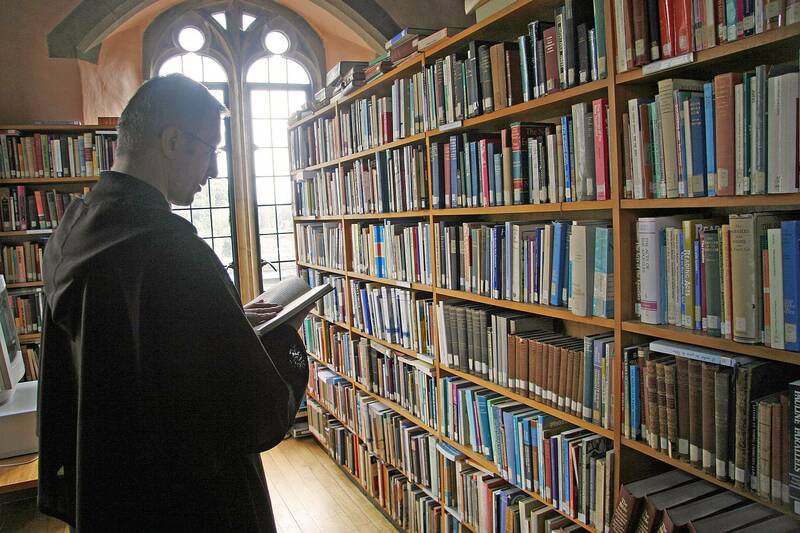 The British Province of Carmelites has two libraries that can be accessed by scholars. Aylesford Priory in Kent houses the Provincial Library which specialises in the academic study of Carmelite history and spirituality (to email the librarian at Aylesford click here). Also at Aylesford is the Pilgrims' Library which provides popular-level resources to visitors. The Carmelite community at York has a small Carmelite spirituality section in the library of the Catholic Chaplaincy. Further information on British libraries with theological collections can be obtained from the Association of British Theological and Philosophical Libraries. To watch a video interview with CIBI students about their experience of Carmelite Studies, click on the arrow button in the box below. CIBI has a group page on Facebook. To visit the page, click on the logo below. Gort Muire Carmelite Centre in Dublin is also home of the Library of the Irish Province of Carmelites which has an online catalogue, as well as the Archives of the Irish Province of Carmelites. The International Centre of Saint Albert (CISA) is the Order's foremost postgradute house of studies in central Rome. It houses the central library of the Order. The Institutum Carmelitanum is the Carmelite Order's international academy of recognised scholars engaged in researching Carmelite Studies. Though its President is usually based in Rome at CISA (Saint Albert's International Centre), its membership is worldwide. The Institutum has its own private research library, the Bibliotheca Carmelitana, at CISA, with a searchable online catalogue. The Archives of the Carmelite Order are located in Rome and can be consulted by scholars who contact the archivist in advance. The Carmelite Institute in Washington, D.C., is a collaborative project of the whole Carmelite Family in English-speaking North America, offering residential and distance-learning courses. The Carmelitana Collection is a private library belonging to the Carmelite Province of the Most Pure Heart of Mary and is located at Whitefriars Hall in Washington, D.C. The library is not open to the public but does welcome scholars and serious students who wish to research Carmelite Studies. The Titus Brandsma Institute in the Dutch town of Nijmegen is a leading centre for the study of spirituality, sponsored by the Dutch Province of Carmelites in partnership with Radboud University, and named in honour of Blessed Titus Brandsma. Also in The Netherlands is The Dutch Carmelite Institute (Nederlands Carmelitaans Instituut) founded in Boxmeer in 1945 by the Dutch Carmelite Province (O.Carm) to support and promote the study of the history and spirituality of the Carmelite Order. Its extensive library and archives can be consulted by visiting scholars. The Centre d'Etudes d'Histoire de la Spiritualité (Study Centre for the History of Spirituality) is a project of the Carmelite Order based in the French city of Nantes. The Institute of Spirituality in Asia (ISA) is an academic research institute for the scholarly study of spirituality, particularly in an Asian context. It is a project of the Carmelite Order in the Philippines. The Carmelite Library in Middle Park in the Victoria territory of Australia is a special theological library dedicated to study and research in the areas of Spirituality and Mysticism. The collection is unique within Australia. The Library is an affliated member of the Melbourne College of Divinity (MCD) and the first resource of the Institute for Christian Spirituality and Pastoral Formation (ICSPF). It is the Province Library of the Carmelite Friars in Australia-Timor Leste. The Carmelite Institute in Malta is a new venture of the Carmelite Family. To read the Institute's blog (in Maltese) click here. Mdina in Malta is the location of the Carmelite Priory Musuem. The Ancient Observance of Carmelites (O.Carm.) also has study institutes at popular and scholarly level in various other parts of the world, including: the Institut Karmel Indonesia in Malang; the Instituto de Espiritualidade Tito Brandsma (IETB) in the Brazilian city of Recife; the Carmelite Institute of the Iberian Peninsula; and the Instituto "San Pier Tommaso" in Rome. The Institute of Carmelite Studies (ICS) in Washington, D.C., is a not-for-profit organization founded in the 1960s by friars of the Washington Province of Discalced Carmelites to promote a richer understanding and study of the Carmelite heritage. Through its publishing house, ICS Publications, the ICS provides the English-speaking world with excellent editions of the Carmelite classics at an economical price, as well as popular and scholarly introductions to a variety of Carmelite figures and themes. The Teresianum in Rome is a Pontifical Theological Faculty and Institute of Spirituality run by the Discalced Carmelite Order. For further information about Carmelite Institutes please consult the relevant weblinks above. Queries can also be addressed to Johan Bergström-Allen in the British Province's Carmelite Projects and Publications Office; to e-mail Johan please click here.